Question 1. Scientists have actually found skeletons of fish in Sahara desert. What could have happened? Answer. Earlier Shara must have been a green and fertile region. But excessive and intensive use of land for cultivation, large-scale deforestation, excessive pollution of land, air, and water, and soil erosion could have led to the conversion of land into a desert. Gradually the green flourishing region must have converted into yellow barren land. Q(i). What are the two types of deserts found in the world? Answer. (i) Hot desert and (ii) Cold desert. Q(ii). In Which continent is the Shara desert located? Q(iii). What are the climatic conditions of the Ladakh desert? Answer. The climatic conditions of the Ladakh desert are cold and dry. Q(iv). What mainly attracts tourists to Ladakh? Answer. (i) Gompas, (ii) meadows and glaciers and (iii) ceremonies and festivities to local people. Q(v). What type of clothes the people of the Sahara desert wear? Answer. People of the Sahara desert wear heavy robes as protection against dust storms and hot winds. Q(v). Name the three that grow in Ladakh? Answer. Willows, poplars, apples, apricots and walnuts. (a Eastern. (b) Northern. (c) Western. (a) Cold. (b) Hot. (c) Mild. (a) Christians and Muslims. (b) Buddhists and Muslims. (c) Christians and Buddhists. Answer: (b) Buddhists and Muslims. (a) Scanty vegetation. (b) Heavy precipitation. (c) Low evaporation. (a) Temple. (b) Church. (c) Monastery. (a) Wheat. (b) Maize. (c) Cotton. Q(i). There is Scanty vegetation in the deserts? Answer. Because of extreme harsh temperatures and little rain fall. Q(ii). People of the Sahara deserts wear heavy robes. Answer. To protect themselves from the dust storms and hot winds. Q(i). On the out line map of Africa, mark the Sahara desert. Q(ii). 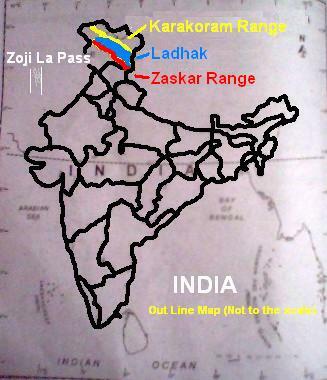 On the out line map of India mark the Karakoram range, Ladhak and Zoji La pass. Q(i). Write the features of the desert areas of the world? Answer. (i) Low rainfall, (ii) Scanty vegetation and (iii) Extreme temperatures. Q(ii). Hoe deserts can be classified on the basis of temperature? Answer: (i) Hot desert and (ii) Cold desert. Q(iii). Name the largest desert of the world. Also mention its area? 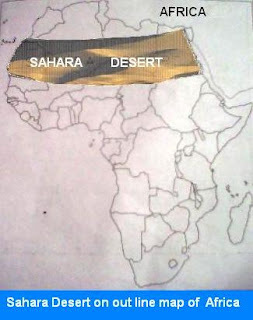 Answer: Sahara the largest desert of the world. It has and area of around 8.54 million square kilometers. Q(iv). Which type of vegetation is found in the Sahara desert? Answer: Vegetation in the Sahara desert includes cactus, date palms and acacia. Q(v). Give an example of a cold desert. WELL.......Thank u Mr Jagdish Singh Sajwan Ranawat!!!!!!!!! Thanks a lot. You saved me from getting a zero! !